Marine Corps Times is scrambling to put together next week’s print edition today, but we wanted to take a minute to send a Battle Rattle thank you to our veterans on Veterans Day. A somber reminder: Staff photographer Chris Maddaloni captured this image today at Arlington National Cemtery, where Sgt. 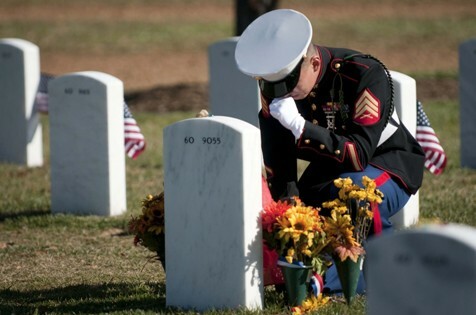 Jay An, of 1st Battalion, 6th Marines, out of Camp Lejeune, N.C., visited the grave of Lance Cpl. Kielin Dunn. Dunn died Feb. 18 during the assault on Marjah, Afghanistan, but those closest to him will no doubt remember memories like those shared in this story. Words could never begin to describe the heartfelt gratitude I have for the brave men and women who serve in the Armed Forces. May God bring peace to the loved ones of those who have paid the ultimate sacrifice. For those of you who have served or continue to serve, I am committed to honoring your sacrifices until my last breath. Thank you and your families for all you do to keep me safe and for putting your life on the line for me.